8th EV EXPO 2018 dedicated to eco-friendly electric Vehicle technology is being organised from December 21 to 23, 2018 at Pragati Maidan, New Delhi. Shri Nitin Gadkari, Minister, Road Transport & Highways shall inaugurate the Expo. 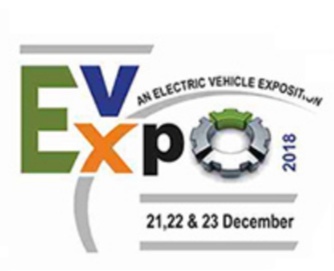 New Delhi, December 18, 2018 - India's biggest eco-friendly Electric Vehicle Technology Expo '8th EVEXPO 2018' is set to begin from December 21 at hall No. 7, Pragati Maidan, New Delhi. The 3 day event shall showcase the latest and technologically advanced, pollution free 2, 3 & 4 wheeled e-vehicles, parts and accessories, charging solutions and technology from more than 150 national and international companies. The Expo shall be inaugurated by Sh. Nitin Gadkari, Minister, Road Transport & Highways, Shipping and Water Resources at 10:30 am on 21st December at Hall No. 7, Pragati Maidan. Spread over an area of 1,10,000 Sq ft, EV EXPO 2018 brings to the Electric Vehicle industry the opportunity to launch and showcase, see and understand the latest in electric vehicles, components, battery technology, accessories and Services for convenient and environment friendly transportation of passengers and goods. The Expo ensures that the right national and international players exhibit their technology and products to the right audience, be it prospective owners & operators, manufacturers, traders and service providers in the E-Vehicle industry. The event offers comprehensive market information, great business opportunity and a platform for networking. Mr. Rajiv Arora, Organizer, EV EXPO 2018 said "This edition of EV Expo shall have the latest and biggest showcase of eco-friendly e-scooters, e-bikes, e-autos, rickshaws, e-cars as well as e-buses for the first time. Many new launches are lined up. We are also showcasing technology to convert existing diesel and petrol vehicles of any category to e-vehicles. Along with Indian and international exhibitors, many Chinese companies are being represented in JVs with their Indian partners under 'Make in India' programme. With Central Government's vision to make India an electric-vehicle friendly nation, and initiatives by many state governments like Delhi to come out with an electric vehicle policy which aims to make every fourth registered vehicle in capital an electric one by 2023, we see a bright future for E-vehicle industry in this country "
• Launch of latest smart e-vehicle charging solutions and batteries. • A full day Conference with the theme "Electric Vehicles- Sustainable Transformation of Indian Mobility" is also being organised during the Expo by IFGE (Indian Federation of Green Energy) & CIRT (Central Institute of Road Transport) on 22nd December. The conference shall be inaugurated by Shri Babul Supriyo, Minister of State for Heavy Industries and Public Enterprises and shall be addressed by specialists from organisations like Niti Ayog, DTC, Mahinda Electric, Kinetic Green Energy, TERI, ICAT, Exide industries, Eseel Green Mobility and various Govt bodies and Associations"
Mr Anuj Sharma, Chairman E-rickshaw Committee, Ministry of Road Transport and Highways , Govt. of India said "We congratulate and thank the organisors of EV Expo who have been providing this ideal platform to showcase and promote the eco-friendly e-vehicles, technology and solutions in various parts of India. The Govt. believes that e-vehicle industry is going to be a big employment generator and it can provide jobs to millions in research, development, manufacturing, services and operations in this eco-friendly sector. The Govt. is already providing loans under 'PM Mudra Bank Yojna' and skills under 'PMKVY'. The 1988 MV act has been relaxed to provide relief to drivers of e-vehicles and 1989 MV rules gives benefit to manufacturers. States have been advised to relax their rules and give entry to e-vehicles for sustainable mass transportation and personal mobility." More than 150 + Indian & International E-Vehicle companies are showcasing their technologically advanced, pollution free 2,3,& 4 wheeled e-vehicles like E-Rickshaws, E-Carts, E-bikes, E-scooters, E-bicycles, E-Loaders as well as 4 wheeled e-car & e-buses at EV-EXPO 2018. Latest Lithium ion batteries, charging solutions and vehicle accessories are also going to be on showcased at the Expo. Some of the prominent Indian companies showcasing their products are Mahindra Electric Mobiility Ltd., Goenka Electric Motor Vehicles, SU Automotive, AUTOLITE (INDIA) LIMITED, Champion Polyplast, Him Technoforge, Greenfuel Energy Solutions, Pastiche Energy Solutions, Okaya Power pvt. Ltd., Fujiyama Power Systems, Altius Techonologies and Soni e-vehicles Pvt. Ltd., etc. China has the highest number of foreign Exhibitors with over 20 Chinese companies showcasing their E-Vehicle products. Prominent ones are PUBANG ETRON ELECTRIC MOTOR PVT LTD, ZHEJIANG NARADA POWER SOURCE CO. LTD. , CY International, Jiangsu Jintaibao Machinery Manufacturing Co. Ltd., etc. Organised by Altius Auto Solutions Pvt. Ltd., EV Expo is India's most comprehensive trade show dedicated to electric vehicles, accessories, batteries and charging solutions. With its first edition in December 2015 at New Delhi, the Expo was being organised twice in a year - at Delhi and Kolkata till 2017. In September 2018, its 7th edition was organised at Bengaluru, where it shall be an annual feature now. The 8th Edition is being held at Hall No. 7 at Pragati Maidan, New Delhi from 21-23rd December 2018. Next edition of EV Expo shall be held at Lucknow from 24-26 May, 2019.